A comfortable hoodie is a wardrobe staple for a lot of men. With so many options available, finding the best hoodie can be a challenge. 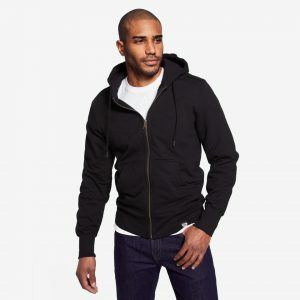 Everyone’s idea of the perfect hooded pullover or zip sweatshirt is a little different, but there are some common factors that you can look for to make sure you are getting the best product possible. Fit, price, quality, and durability are essential for most men when they are trying to find the best brands. But what takes a hoodie to the next level is how comfortable it is. The following are some of the most comfortable hoodies ever. 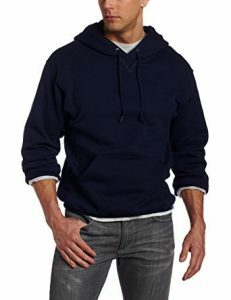 Gildan sweatshirts are very popular as a budget option. This heavy blend design is lined with fleece and is very soft. It is on the thicker side, so it is excellent for cold weather wear. The kangaroo pocket is big enough for your hands, along with a few other items. It has a deep hood and a nice long string on the hood. Like most Gildan products, it is well made and should stand up to a lot of wear. It is a good option if you are on a limited budget. It is made of 50% polyester and 50% cotton, and it comes in 40 different colors. Lululemon is usually a pretty good place to get comfy, good quality sweats. They can be a little pricey, but the brand is able to maintain a loyal following due to the high tech fabrics and features of their styles. Their best sweatshirt is the City Sweat Pullover Hoodie. This style has recently been slightly updated, which is something Lululemon loves to do to it’s most popular styles. This latest version of the City Sweat Pullover maintains the breathable, sweat-wicking fabric of earlier versions that has the wonderful ability to adjust to the temperature of your body, so you never get too hot or too cold. Currently, it comes in 5 subtle heathered colors; the colors change year to year. To maintain the streamlined look it has the excellent feature of a hidden media pocket so you can store your phone as well as a coin pocket. The City Sweat is a good pullover style that works especially well for colder conditions. The Reigning Champ Hoodie is considered by many to be one of the best men’s designs around. The most popular Reigning Champs style is their mid-weight 100 percent cotton hoodie that is handmade in Vancouver. You can get the Reigning Champ Full-Zip in a lightweight or heavyweight material. They have a reputation for being high quality, super comfy, and very durable. 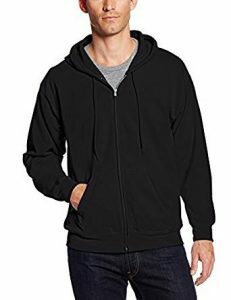 They have a slimmer fit than a basic hoodie, so they look great on most men. The only downside is that they are a little on the pricey side. 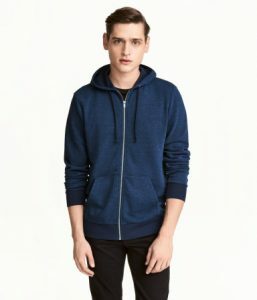 If you are looking for a budget option, H&M hoodies are worth considering. They have a slim fit, come in a variety of colors, and are very comfy. They are a little on the thin side, so they are a great hooded option for layering. The best thing about these sweatshirts is the super low price and that they are pretty soft on the inside. They are made of 60% cotton, 40% polyester. 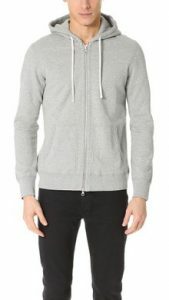 Find at H & M.
Some other really popular men’s hoodies are a few of the ‘made to last’ options from Everlane. The very popular Everlane French terry, which is 100% cotton, is excellent for wicking sweat and stopping you from getting too hot. One great thing about cotton is that it gets softer with age, which is exactly what happens with this style. Everlane is an exciting company that focuses on transparency about the factories where their clothing is made and how the company is run. They also break down the costs to produce the clothes and encourage the consumer to question why the company makes the decisions that it does. On the Everlane website, they have an interesting graphic at the bottom of each items page that explains the cost of the garment. 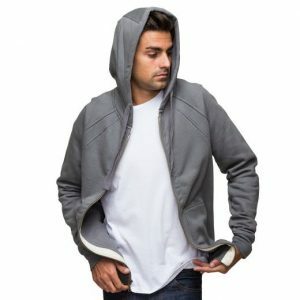 For those who want a sweatshirt that is going to last for years, you will probably want to take a look at the Flint and Tinder 10-Year Hoodie. This style was born from a Kickstarter campaign designed to create a garment that will last for at least 10 years, rather than have a limited lifespan, as so many of today’s clothes do (it ended up being Kickstarter’s first million-dollar fashion campaign). This design is a slim fit that is made with a soft, yet durable, fleece. The seams are all reinforced, and the zippers are heavy duty. It comes with a 10-year guarantee that includes free mending. It isn’t cheap, but if it lasts 10 years, then it will be worth the investment. 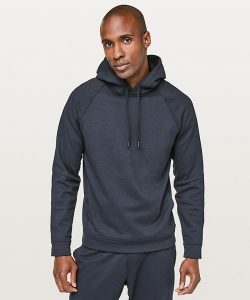 If you live in a warmer climate or are looking for a thinner sweatshirt for the summer, the Hanes Men’s Full-Zip EcoSmart Fleece Hoodie is a great design to check out. It is made from a very soft and comfortable blend of 50% Cotton/50% Polyester. The interior of the design is a beautiful, light fleece. Since it isn’t a heavy fleece, it won’t keep you warm in frigid weather, but it will do the job for slightly chilly weather if you wear it as a layer. If you don’t mind spending some money, a lot of people like John Elliott + Co. sweatshirts. It is a designer brand with a designer price tag to match. 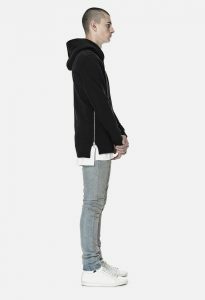 Made in the USA, John Elliot has a couple of different hoodie designs to choose from, with their most famous being the Hooded Villain. The Villain is a favorite partly because of the slim fit and the two zippers up each side that can help give your sweatshirt a little more style. People also love the soft knit terry fabric, which is 100% cotton. 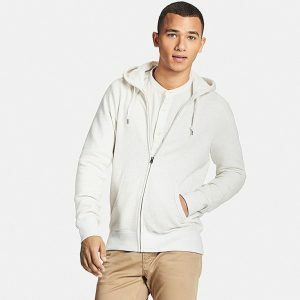 A lot of men love the many different Uniqlo sweatshirts for comfort; with their Men’s Zip-Up Hoodie being a particular favorite. The key to the popularity of this sweatshirt is the pre-washing process that the 100% soft cotton material goes through before the sweatshirt is made. The pre-wash process means that the hoodie has a worn-in feel to it, making it very smooth. It has a double zipper to open from the bottom. I never really understand the reasoning behind the double zipper, but I guess you use it for ventilation or to stop the material from bulging at the waist. If you are looking for a moisture-wicking, hooded, pullover sweatshirt, the Russell Dri Power Fleece Sweatshirt is a great budget option. This design works well if you are exercising and are sweating a lot since it will wick the sweat away from your body and keep you dry and comfortable. This design tends to be a little baggy or oversized, so if you like a tighter fit, you may want to go for a smaller size. The material is a blend of 50% Cotton, 50% Polyester, which is soft and will also keep you warm. If you need a durable, warm option for work, especially if you have to work outside, Carhartt has a number of great design options. They make their hoodies to be a little roomier than the more fashionable, slimmer fit options, so you know they will be super comfortable. 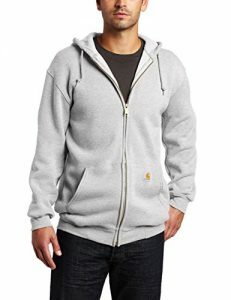 One of their most popular styles is the Carhartt Men’s Midweight Zip Front Hooded Sweatshirt. It is a 50% Polyester 50% cotton blend so that it will be warm. It also has a high quality brass front zipper that won’t snag or stop working. 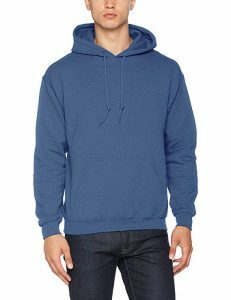 American Giant has a number of different comfortable hoodie options, ranging from styles made with very light fabric to a heavyweight material that is more like a jacket. Their best choice for comfort is their Classic Full Zip. It is a 100% cotton sweatshirt that is considered a mid-weight fabric. The design is slightly slimmer than you may be expecting, but it works well for most men. People who own this sweatshirt say that it is very durable while still being comfortable. It is made in the USA. 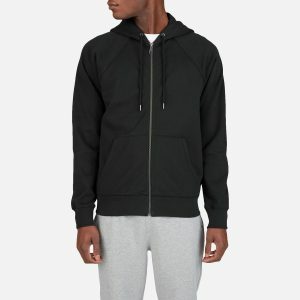 Pricing– You can get a men’s hooded sweatshirt for any budget. They range in price from the $15 to $200 + for designer brands. The difference in price usually comes down to the material that the sweatshirt is made from (expect to pay more for 100% cotton, less for cotton polyester blends), branding and marketing costs, and where the hoodie is made (if it is made in the USA or Canada you will pay more). In some cases, the styles that are in the $80-$100 range will be a little more comfortable and should last longer than the $15 Hanes designs. Fabric-The most comfortable styles are made of either a 100% cotton, a cotton polyester blend, or cotton fleece. Cheaper brands tend to use more polyester, which can be good for staying warm, although polyester can become less comfortable the more you wear it. 100% cotton options tend to become softer the more you wear them. Thickness– When you are shopping for a hoodie it is worth spending a small amount of time thinking about when and where you are planning on wearing it. The reason you want to do this is so that you get a hoodie that has a material that is made of the right amount of thickness for situations you may find yourself in. If you live in Florida, you aren’t going to want to buy a heavyweight American Giant hoodie, since they get pretty warm. If you want a sweatshirt for the summer, you should look for a lightweight material. For most people who buy a design to stay warm in the winter a great all-around material is usually a mid-weight fabric.